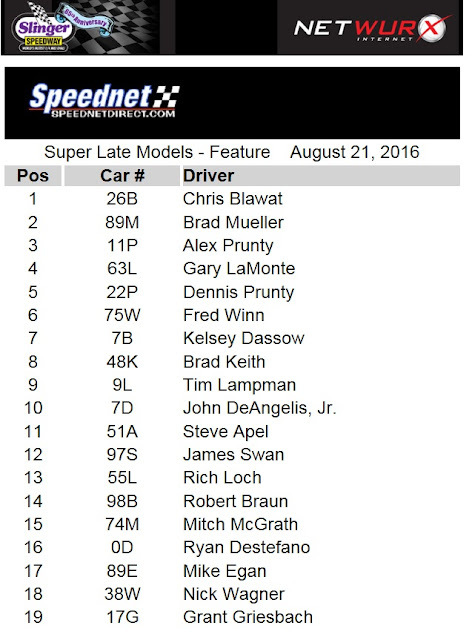 Slinger, Wis., Aug. 21— In a race that resembled a street brawl leaving many drivers with battered race cars and tempers, Chris Blawat emerged from the chaos with his fourth super late model feature victory of the season following the 60-lap Pepsi Challenge Final Round Sunday night at the Slinger Super Speedway. John DeAngelis Jr. and Tim Lampman brought the field to the green flag and the inside lane proved to be the groove of choice as DeAngelis charged to the lead as Chris Blawat, Rich Loch, and Alex Prunty used the low side to advance to second through fourth respectively. DeAngelis paced the first seven circuits before Blawat was able to edge under him to take the top spot on lap eight and Loch followed a few laps later to grab second. 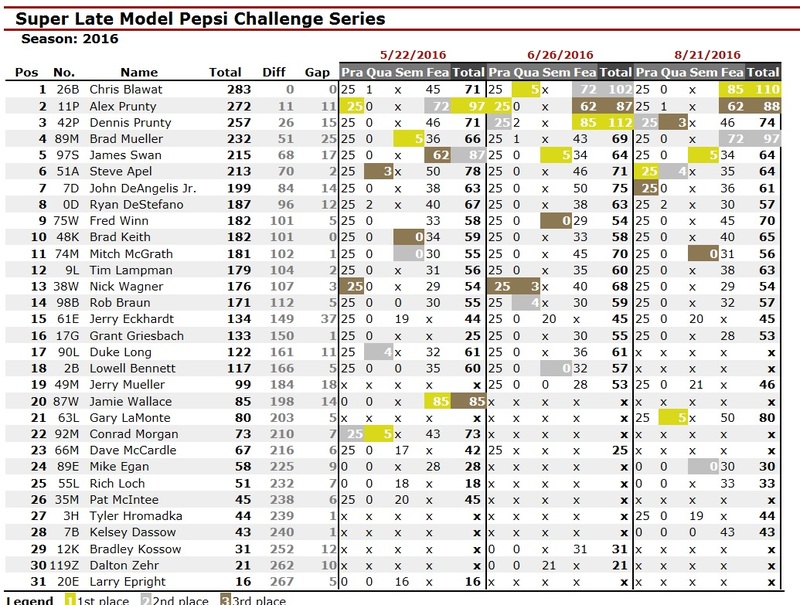 With DeAngelis caught on the high side, Alex Prunty, Dennis Prunty, Steve Apel, and Brad Mueller all worked their way by using the bottom groove. 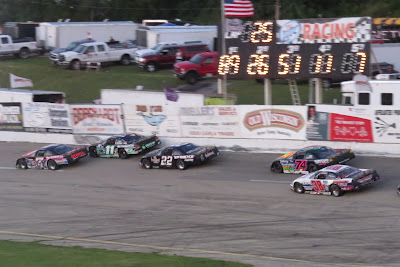 Fred Winn’s car spun off turn four on lap 26 while racing for position with Mike Egan and the first caution flag appeared with Blawat leading Alex Prunty, Dennis Prunty, Loch, and Apel. Blawat chose the ouside lane for the restart and the decision proved costly as Alex Prunty drove to the lead as racing resumed from the bottom groove. Blawat settled into second while Dennis Prunty and Rich Loch battled for third, at one point making contact that sent their cars scattering loose but both drivers as well as those behind them maintained control as Prunty took the position. 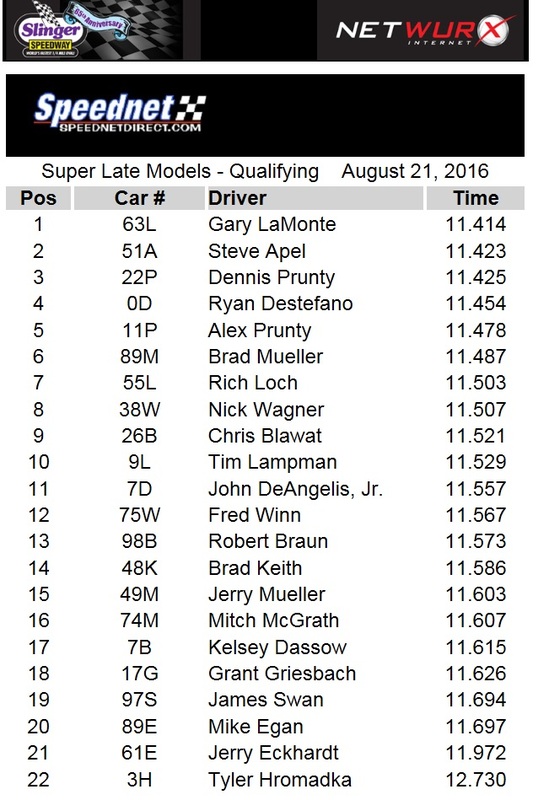 Steve Apel also moved around Loch to snag the fourth spot and Brad Mueller advanced to fifth after some side by side door rubbing laps. The caution flag waved for the second time on lap 33 when Fred Winn and Nick Wagner tangled in turn four. Alex Prunty chose the inside lane for the restart and he maintained his lead over Blawat while Dennis Prunty slotted into third ahead of Apel, Mueller, and Gary LaMonte. Behind the leaders, Tim Lampman and Ryan DeStefano rubbed fenders while racing for position in turn one and when Lampman got to turn three, a flat tire caused his car to spin, drawing another caution flag on lap 37. Alex Prunty once again held the lead over Blawat and Dennis Prunty as racing resumed but after only one lap was completed, Dennis Prunty’s car broke loose in turn four and he saved it as it skidded up the racetrack. Upon exiting the corner the field jammed together as Prunty gathered up his car with Steve Apel being forced to lift off the gas where his car was then struck by Rich Loch. Rob Braun became collected with Loch’s car while Mitch McGrath’s car leaped over Braun’s side and landed across Loch’s hood as the caution appeared once again. Apel left the track to repair body damage while Braun, McGrath, and Loch retired from the event and Dennis Prunty restarted from the rear of the field for his involvement in the incident. 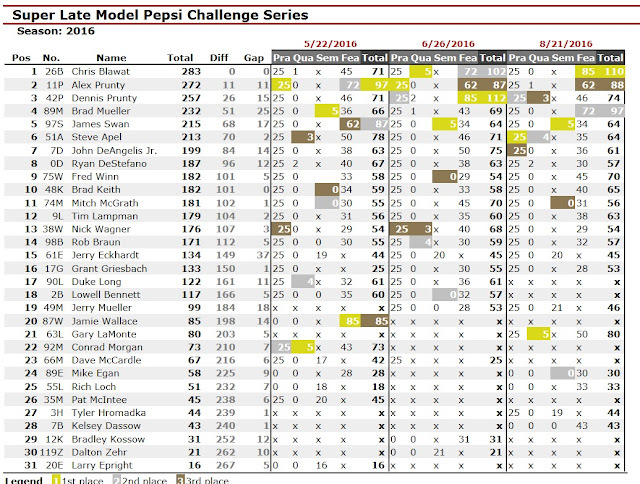 The race resumed with Alex Prunty still leading over Blawat and Brad Mueller with Gary LaMonte and John DeAngelis rounding out the top five. Alex Prunty continued to hold Blawat and Mueller at bay as the caution waved on lap 43 for a Kelsey Dassow spin in turn three. Once again the race only resumed for a lap before Steve Apel spun across the track in turn three while racing for position with James Swan and struck the wall hard with the left rear of his car bringing out the caution flag again. Apel’s car was severely damaged in the incident and Swan was sent to the pits for extracurricular activities under the caution flag. Alex Prunty again chose the inside lane for the restart and raced into the lead over Blawat and Mueller as racing resumed. John DeAngelis occupied the fourth spot ahead of Gary LaMonte and Dennis Prunty who advanced to sixth from the rear of the field. With the laps winding down, Alex Prunty’s car began to get loose off the turns and his car slid sideways exiting turn two, allowing both Blawat and Mueller to get by before he gathered the car up. With Blawat now leading and being dogged by Mueller in second, Alex Prunty fell into a fierce battle over third with DeAngelis. On the final lap, Mueller looked to Blawat’s inside but was unable to make a move as Blawat drove to his fourth super late model feature victory of the season. Mueller had to settle for second place while contact with DeAngelis in the fourth turn on the way to the checkered flag sent Alex Prunty spinning into the infield at the finish. Track officials penalized DeAngelis for the incident and Prunty was awarded third place with Gary LaMonte and Dennis Prunty rounding out the top five finishers. Fred Winn finished sixth ahead of Kelsey Dassow and Brad Keith. Tim Lampman finished ninth and John DeAngelis was tenth following the penalty. James Swan won the 30-lap super late model semi-feature over Mike Egan and Mitch McGrath. Keslsey Dassow finished fourth and Jerry Mueller was fifth. Super late model heat races were won by Mike Egan, Rob Braun, and Brad Mueller and Gary LaMonte was the fastest qualifier with a lap of 11.414 seconds.